So, I finally got a crosstrainer - the one I got is a Kettler Mondeo. It's awesome. It's great being able to have a really great workout where I sweat a lot and I don't have to go to a gym. This is great for me because for one, I'm not really able to go to a gym because I have children at home asleep in their beds and I can't really be going to the gym... and two, if it was pouring rain outside, I'd be a whole lot less likely to get on my bike to go to the gym anyway. Sunday- day of rest... although, we do usually visit a park and let the kids play and then go for a walk through the woods - or around the neighborhood - and we usually visit a different park every week. Monday - crosstrainer - I started out at 30 minutes, and have increased to 45 minutes or 5 kilometers, which ever comes first. Tuesday - aerobics - I've been alternating between three different videos. Tonight I did Women's Health Total Workout in Ten - it's a great workout - I totally recommend it. Look - Amazon has it - for a great price, too - why don't you pick up a copy today?! Wednesday - day of rest! So, that's what I've managed to do the last two or three weeks and I'm happy to report that I've lost 10 pounds... yes - 10 pounds... and my face is slimmer and my belt pin now goes in two holes tighter - you know what I mean! *I totally gotta put this out there... you need a pilates ball or balance ball for the Women's Health video if you want to do the core training - which I recommend - because who wants to have flabby abs? Not me! What I did was buy this: Gaiam Total Body Balance Ball Kit. And included is a DVD and stretchy band thingy. This workout doesn't feel like much. I mean, you don't sweat very much, but by the second and third day you feel it throughout your whole body -- it really is a total body workout! So, I do the Women's Health workout one day, then the next time I do this Total Body Balance Ball workout, then the next time I do Pump it Up Aeroburn and it's got a hot dance mix included... it lasts about 60 minutes if you do the whole workout... I don't usually last that long. I like it because the main guy has a nice English accent and the girls have amazing bodies... it's something to work toward... and there is this one move in that workout that leaves my love-handles feeling like they aren't going to be jelly rolls for long. So off of that tangent and back to green - there are two very green recipes I'd like to share: Peas Palak and Lovely Green Soup. Totally green right! 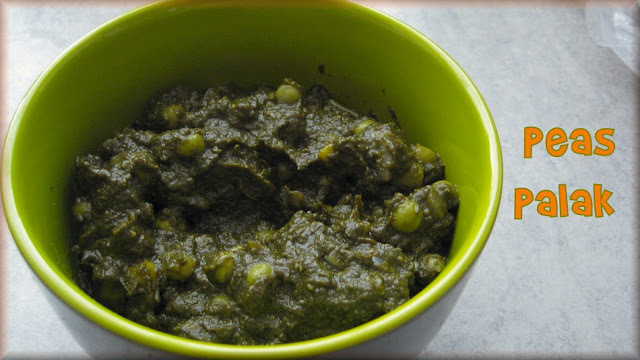 Peas Palak is spinach and peas... and add a bunch of Indian spices, some pita bread and you have yourself a delicious appetizer. I've also used this in wraps and on toasted ciabatta bread with grilled veggies. It's very good! I love soup - a lot. I eat it a lot. But I don't blog about soup a lot because there are a lot of mediocre soups out there. Most are okay. Then sometimes I come across really awesome excellent soups... and this is one of them! Ha! 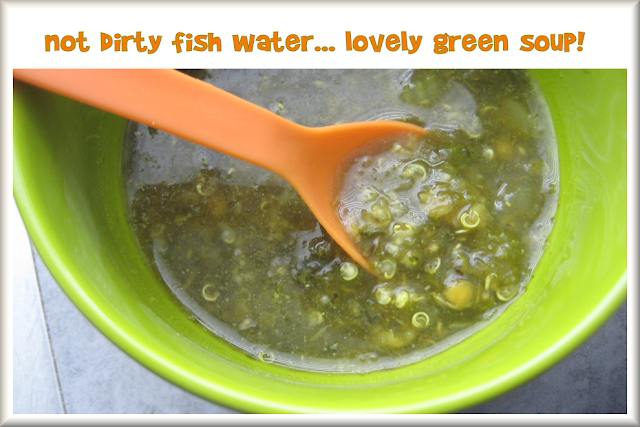 The first time I made this soup, Mark called it dirty fish water. Yeah, that's exactly what he said... in front of the kids... I thought they might not eat it... but luckily they did. Phew! I told them, it's called Lovely Green Soup - and it really is lovely. Okay, I made just a few minor adjustments to the original recipe - and that's okay, because the author of the lovely soup said to 'experiment with this soup' - as she has over the years. Bring water to the boil. Add the bouillon tablets, oil, celery, onion, garlic, zucchini, spinach and herbs. Reduce heat and simmer about 20 minutes. Remove from heat, using hand held mixer puree partly, allow some texture to remain. Return to medium heat, stir well and add the lentils, quinoa and curry to taste. Serves 8 - serve with crusty bread. Good for you! I started a diet, yesterday. I'm STARVING. I have a new friend who's invited me to work out. She's skinny and stunning; I'm stressed at the mere prospect. Here is a great beginner abdominal exercise to help get you started on the path the having the amazing abs you want. This is a good abdominal workout if you are just starting out.